Theatre Review: Paw Patrol Live! 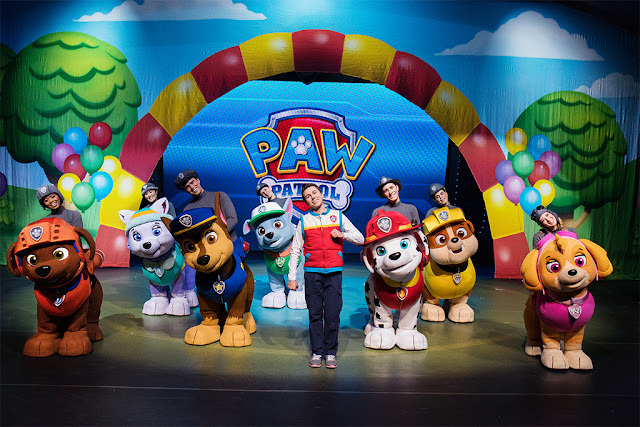 "Race to the Rescue"
All three of our girls love PAW Patrol, so we were desperately excited to be invited to see the live show at Wembley's SSE Arena last week. Chase, Marshall, Zuma, Rocky, Skye, Rubble and Everest are like old friends here, with many a rainy afternoon filled with a Netflix binge of the cartoon. Skye, being pink and a girl, is predictably the girls' favourite, but Chase is a very close second (and I may have a bit of a soft spot for Rubble on the Double). We couldn't wait to see them all! We've had a bit of a countdown going on for show day, tempered slightly by seeing The Wiggles last week, but the anticipation was definitely high. We were hosted at a lunch reception by the PR company beforehand, which was lovely, and had plenty to keep three very excited little girls busy: face painting, colouring, slushies and food, perfect. Tatiana had her face painted for the first time and loved being Skye for the afternoon. Despite the attractions - and full tummies - the anticipation knew no bounds when we headed down to the auditorium, and from the second it started all three girls were utterly enthralled. One of our random collection of family New Year's resolutions was to go to the theatre more, and we have been trying to meet the challenge, so this definitely fit the bill. But how would they bring the cartoon to life on stage? Rather than opting for the person in costume idea, the cast were almost guides for the pups and it was really effective. You truly did forget they were there after a few minutes and watched just the pups. The story revolves around the Great Adventure Bay Race which Mayor Humdinger is desperate to win. Mayor Goodway hurts her ankle rescuing Chickaletta so she can't compete, but Ryder and the PAW Patrol pups are there to save the day again and race to find the clues before the Mayor can. But is he up to his usual tricks? Will the pups find the clues hidden around Adventure Bay and make it to the finish line before he does? All the pups get involved and there are various problems along the way as they search for and find clues hidden around Adventure Bay. There is an undersea adventure so Zuma, Wally the Walrus and Captain Turbot can get involved, Skye flies to find a clue, and Rubble and Rocky even get stuck on a mountain and call for help from Everest.